KNOXVILLE, Tenn. — In his final game at Neyland Stadium, senior quarterback Joshua Dobbs accounted for five touchdowns to lead the Tennessee Volunteers to a 63-37 victory over the Missouri Tigers on Saturday. The Vols (8-3, 4-3 SEC) took the lead over Missouri (3-8, 1-6) midway through the first quarter, and while the Tigers’ kept pace with Tennessee’s scoring through three quarters, the Vols never trailed the rest of the way. Tennessee forced four turnovers and did not commit any themselves. Two Tennessee interceptions resulted in 14 points for the Vols, including an 59-yard interception return by Jonathan Kongbo. 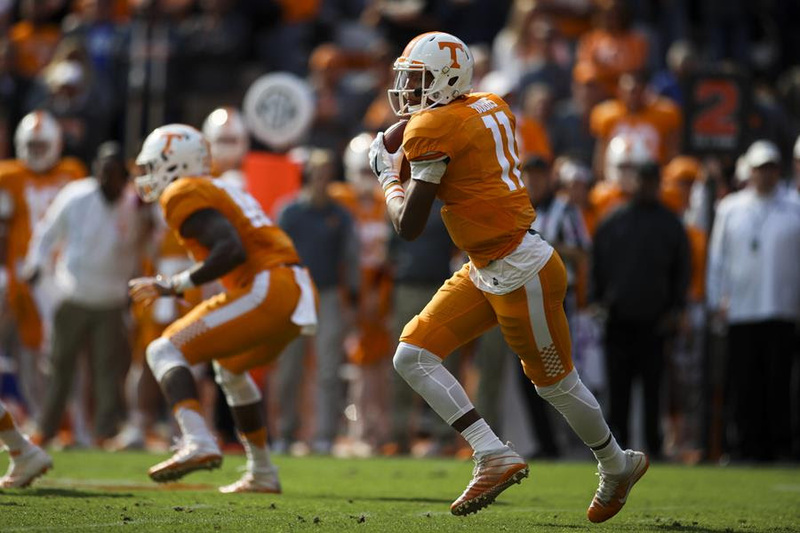 Dobbs opened the scoring for Tennessee when he connected with Jauan Jennings, who made a leaping grab and stepped over a defender on his way into the end zone for a 49-yard touchdown. Aaron Medley’s extra point put the Vols in front 7-6 with 6:01 left in the opening quarter after Missouri had missed an extra point following its opening touchdown. Tennessee broke away in the fourth quarter, outscoring the Tigers 28-10. It marked the most points the Vols had scored in a quarter this season and the first time the Vols had passed the 60-point marker in a game since a 63-7 win over Western Kentucky in 2009. The Vols amassed 609 total yards, 223 passing and 386 in the air, averaging 9.1 yards per play. John Kelly rushed for more than 100 for a second time this season, finishing with 101 yards and a touchdown on 18 carries. Alvin Kamara scored two rushing touchdowns and finished with 55 yards. Jennings caught four passes from Dobbs for 67 yards and a two touchdowns. Josh Malone led the Vols with 83 receiving yards and his ninth touchdown reception. Missouri finished the game with 740 total yards, the most yards the Vols have given up in a game in program history. Defensively, Micah Abernathy led the Vols with 12 tackles plus an interception and 26-yard return that resulted in an eventual Tennessee touchdown in the third quarter. Rashaan Gaulden and Darrin Kirkland Jr. had nine tackles each. Derek Barnett recorded another solo sack, giving him 11.0 this season and 31.0 in his career, putting him just one sack away from tying Reggie White’s program record for career sacks (32.0). UP NEXT: the Vols travel to Vanderbilt for the final game of the regular season Nov. 26 at 7:30 p.m. Eastern. The game will be televised on the SEC Network. 100K HOME: Saturday’s announced attendance was 101,012, giving the Vols’ a season average of 100,967 yards at Neyland Stadium. It is Tennessee’s highest home season average since 2008 (101,448).